Banefire’s reference to the number five ties it loosely to Naya’s five theme (usually in the context of a creature’s power) from the Shards of Alara block. In larger formats, it offers an unstoppable game-ending threat to any deck that can get to an X value of 5. The similarity of its text with Dissension‘s Demonfire invites comparison, but really they’re for different types of decks: a lot of ramp decks don’t necessarily want to empty their hand as fast as possible. Demonfire’s exile clause can be relevant against creatures with undying and persist, but if you’re playing something like Heartbeat of Spring or Vernal Bloom, Banefire is probably the Fireball variant that synergizes most with that type of strategy. 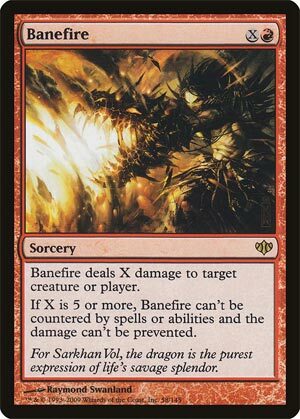 One of the many Fireball variants we have gotten over the years, Banefire is a nice thematic link to Dragons being large and threatening: if X is large enough, there’s not much you can do about it. Here, if X equals 5, Banefire is uncounterable and unable to be blocked by damage prevention; there are still ways to blunt it (protection makes the target ineligible, along with shroud or hexproof), and redirection still works, but Banefire generally will be a hard-to-answer finisher with the ability to serve as small-scale removal before then. Which of the many Fireball variants is best for you is a question of personal preference and taste, as well as your needs, but decks able to generate a healthy amount of mana will find this spell welcome.